Shakshuka has quickly become my favourite brunch dishes! I can wholeheartedly say that because Avocado Toast and I are in an ‘all-day-every-day’ kind of relationship! But enough of Avocado Toast for now. Let’s talk brunch and softly poached eggs in spicy tomato sauce. Sounds incredible, right? Right! Compared to other countries breakfast in Germany seems like a boring affair. Don’t get me wrong, our cuisine has some gems to offer. Breakfast is – in my opinion – just not one of them. Staples here are Cereals or Müsli, often with fruit and yoghurt. Bread with cold cuts and cheese or marmalade and honey for the people with a sweet tooth. On weekends soft or hard boiled eggs sometimes join the party. Of course, there are also local specialities but from what I have experienced that’s what most people would eat on a regular basis. When you go out to a restaurant for breakfast there are of course options. But even there you will rarely find something more adventurous than smoked salmon or the occasional offer of smoothies. I love egg dishes. But when it comes to eggs the menu usually only contains scrambled eggs, fried eggs or if it gets really fancy, sometimes an omelette. No spices and no sauces. No tacos, breakfast burritos or bowls. And certainly no poached eggs, which are hands-down my all time favourite. Hence, every time when I go on a holiday I am all over breakfast and brunch in every other country. I probably need to fend for myself here! 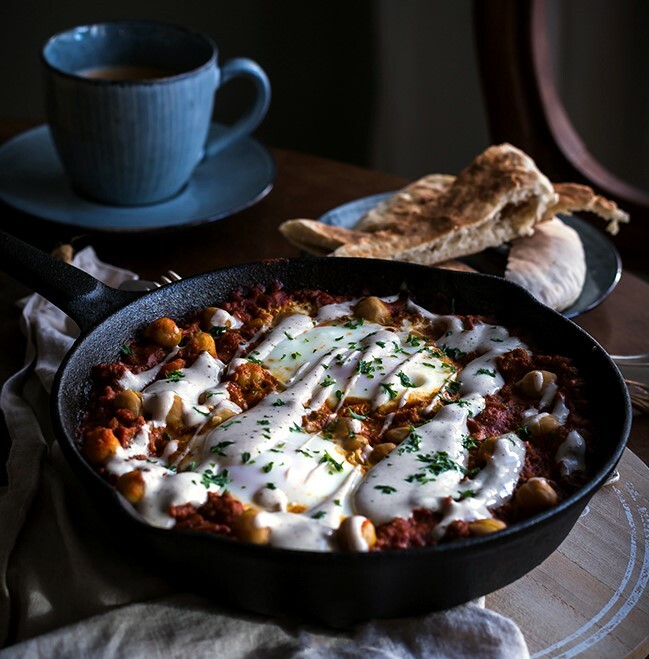 One dish that is surely ticking all my boxes when it comes to delicious breakfast food is Shakshuka. It’s warm and spicy, comforting like a hug from a good friend and – in my eyes, the best part – is usually been eaten with a side of delicious, warm pita bread. Who can resist this? Seriously! Shakshuka is a common breakfast dish in Arab and Israeli cuisine with many variations out there. All recipes use a base of tomato sauce in which the eggs are being poached. Other common ingredients are garlic, peppers, chillis and onions. Some recipes add potatoes, eggplants and zucchini. But there are also recipes using a variety of vegetables and are more ratatouille style. Almost anything goes. Therefore I love this dish. So we are going to be a little more creative today and add beef and chickpeas to our tomato sauce! This Shakshuka is a spicy and hearty dish that is naturally high in protein. Satisfying and filling for hours. Perfect for brunch! Add the tomato sauce and all the spices and garlic and stir through until everything is well combined. Once the tomato sauce starts boiling decrease the heat to medium. Add the chickpeas and stir through. Gently slip the eggs into the tomato sauce and let everything simmer until the eggs are softly poached. This takes about 10-15 minutes*. Meanwhile give all the ingredients for the yoghurt sauce in a small mixing bowl and mix well together using a spoon or fork. Once the eggs are done, garnish the shakshuka with the tahini yoghurt sauce and sprinkle over some parsley if desired. Serve immediately**! *You can also speed up the poaching process by putting a lid on the pan. In full disclosure, this is not at all my own idea. I ate Shakshuka with ground beef and chickpeas in this restaurant in Sydney last year and just badly needed to recreate it! And if you’re ever in the area you should definitely check it out! And until that, make this recipe of Spicy Beer and Chickpea Shakshuka! What’s our favourite breakfast dish? I adore a good Shakshuka, although I’ve never dipped fresh pita in it, and I regret this now. Clearly, I need to recreate this glorious recipe (sans beef) and get myself some pita. I had the most amazing shakshuka in a small Israeli cafe near Newtown in Sydney. Small family run cafe who had immigrated from Tel Aviv 15 years earlier… Holy smokes there was so much love in this dish! So, of course, I really want to make this dish at home and I cannot wait to give this a try. And that tahini yoghurt dressing really is the icing on the cake! These pictures are unbelievable. Stunning!! I love shakshuka and its been far too long since I made one. Chickpeas and pita are brilliant additions. Well done!! Thank you so much, Cora 🙂 I have a full-blown love affair with this dish!